Cinetto bi-folds; not just full width access to wardrobes and kitchen and pantry cupboards, but also a modern, streamlined look. Not just full width access to wardrobes and kitchen and pantry cupboards, but also a modern, streamlined look. Cinetto’s bi-fold door system includes tracks, slides, hinges, bifold hinges and slice covers; everything you need to create a super smooth, quiet bi-fold door system for kitchen cupboards, pantries or wardrobes. 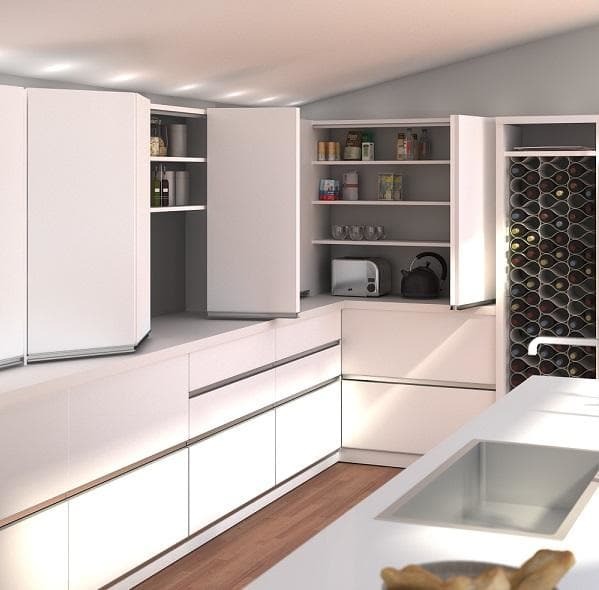 Granting full width access to cupboard spaces, the Cinetto bi-fold system provides a space efficient solution whereby open doors fold together into a compact form. Suitable for timber or aluminium-framed glass doors up to 50kg, Cinetto bi-folds glide smoothly with high quality ball bearing rollers on a sliding block. For more information, please visit CINETTO BIFOLD DOOR SYSTEMS.